We are proud to announce that we have expanded Joya de Nicaragua’s presence in the Managua International Airport, the most important travel hub in our country. This new flagship store, or ‘heritage store’ as we call it, will provide a top sensory experience, comparable only to a visit to our factory and fields. 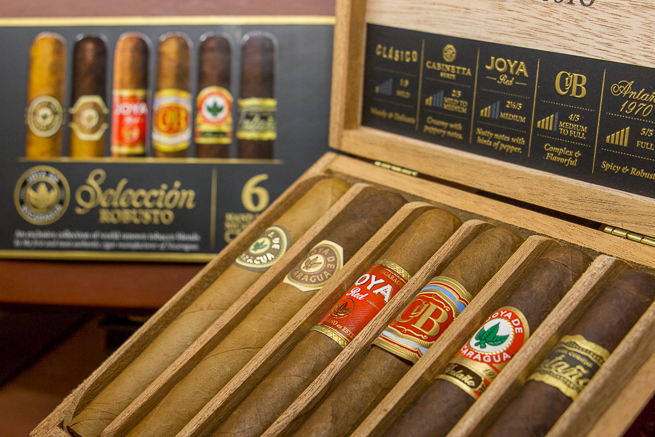 You will be able to hear about, see, touch and smell the finest tobacco Nicaragua has to offer. What Will You Find in the Store? 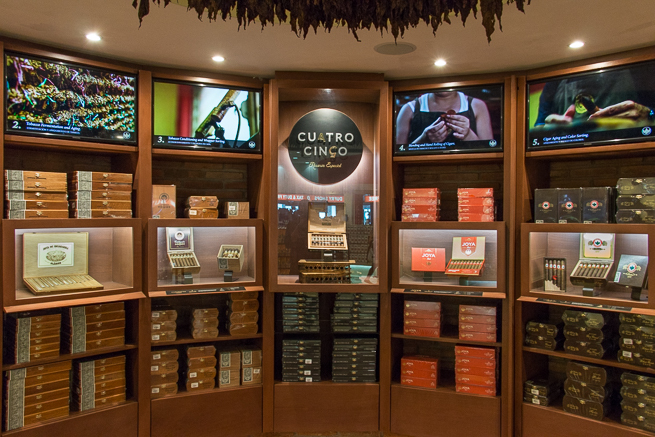 Our store is the only walk-in humidor at the Airport, which means our cigar boxes are well humidified and ready to be enjoyed. 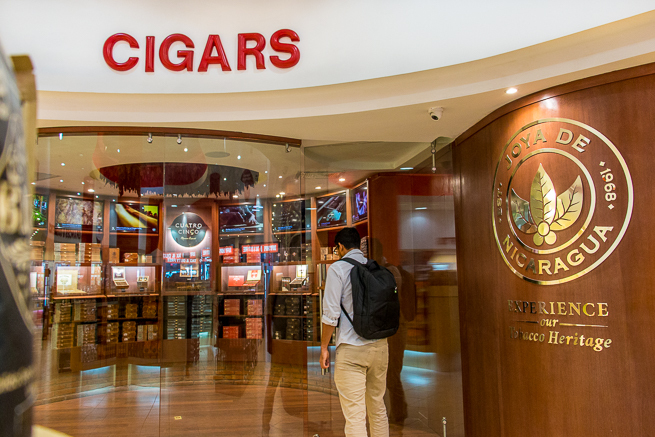 You will find our most emblematic cigar brands, but also, exclusive duty-free packaging offers like “petacas” of 3 or 6 cigars, and special assortments. You will also learn about the process of creating our handcrafted premium cigars through our dedicated screens showing the seven stages to create our premium cigars, “from the tobacco fields to your hands.” Eager to learn more? you will be able to put on a pair of headphones to get insightful information about our factory and brand in an entertaining way right from another big screen. You also have the option to interact and learn with a specially designed table with backlit tobacco leaves to discern different tobacco origins and their characteristics. 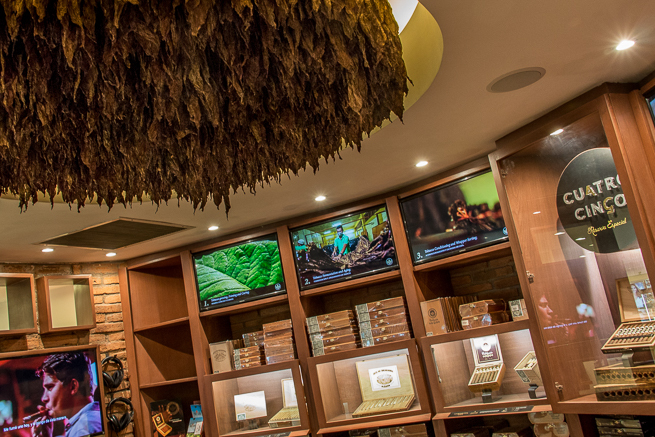 If you just feel like browsing around, look up to find a majestic roof filled with tobacco leaves as we try to replicate the experience of being in one of our curing barns. Couldn’t make it to one of our factory tours? Looking for a last minute gift? If you are flying back home from MGA, look for our store inside Dufry, where we built our own space, concept and design. It’s located in the duty free area in front of the international departing gates. We are incredibly excited to welcome you to our new store. We have worked on this project for a while now, and can’t wait to provide you with a unique place to buy and learn about one of the biggest pleasures of life, and one of the most recognized products of our land: cigars.